In this video we shall discuss 100 MCQ Based On Union Budget 2018-19 For SBI CLERK, UPSC, SSC, CTET, IB ACIO. This session is very important for all aspirants. 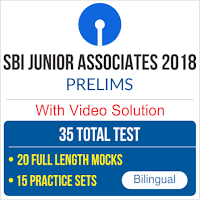 In this video we shall discuss 3 In 1 ( Reasoning + Maths + English ) DAY-2 For SBI CLERK PRE 2018. This session is very important for all aspirants.